IT has all the appearance of a well-intentioned attempt to square the circle between the youth’s need to find an occasion to express affection and joy (hardly an unseemly impulse) and the religious right’s calls to ban anything it deems in opposition to our culture and values (an ever-widening basket of ‘offences’). And it may well be were it not for the fact that, beneath its benign surface, the alternative it offers betrays the selfsame posture of moral policing as its more strident diktats. The announcement by a varsity in Faisalabad that it would observe Feb 14 as ‘Sisters’ Day’ might seem like a frivolous attempt at rebranding Valentine’s Day to give it a patina of ‘respectability’ (the vice chancellor’s stated rationale was to turn a ‘threat’ into an opportunity). Yet the VC also said that the university was mulling plans to distribute scarves, shawls and gowns to its female students. 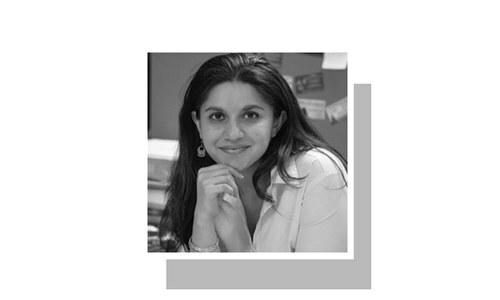 Implicit in this is the suggestion that what Pakistan’s sisters truly need is not gender parity (or even so much as a token gesture of genuine esteem) — but to cover themselves up. The Pakistani sisterhood might look at such a backhanded proposal with bemusement, and wonder at the neglect of the nation’s brothers for the lack of public interest in their behaviour and attire. Objectifying women’s bodies to counter purportedly Western perversions is surely an irony lost on our self-appointed gatekeepers of public decency. But it also speaks to a broader phenomenon in which, every year, state and private institutions alike descend into paroxysms of panic at the advent of Valentine’s Day. Legal, official or societal interventions to browbeat the public into abstaining from cheer demonstrate lack of restraint and respect for people’s right to choose. And it is particularly sanctimonious juxtaposed with genuine, year-round social ills such as misogyny and gender-based violence (the antidote to which is not further maladjustment) conveniently ignored by those who would seek to proscribe all inter-gender interactions. Hopefully, this February, better sense will prevail. Doubt if better sense will prevail, as long as these 'self-appointed gatekeepers of public decency'are around. In our society husband and wife can’t even hold hands in public, why is that anybody’s problem? Hopefully these haters, who are wrong in many ways themselves, just shut up and let people live. In short “mind your own business”! Live and let live! February 14th is Valentines Day. Show some heart and let love for someone besides yourself shine... You've got the rest of the year to engage in abrasions, conflict, and hate... Love! I’d like to say No to these narrow minded haters, not to Valentine’s Day. State has no right to interfere in anybody's personal likes or dislikes, why do you want to enter anybody's personal arena using cultural and religious bow sticks. All these days including Christmas and Eid are being great business ventures and ironically the people calling for the boycott would be most probably the ones selling flowers on the roads on that day. Hypocrisy is the banner that many of this nation feel pride to hold high above their diminutive size. Not all women are sisters and not all are mothers because right among them have to be the wives who would mother the next generation. Amazing how insecure one can get. One university wants to do it its own way, and so many people get nervous. Relax guys, when you say people have the right to choose, that includes everyone. Valentines day is not a Muslim festival and it should not be imposed as such upon Muslims anywhere either by the so-called civil society or any one in the government or outside the same. 14th Feb: anti-moral policing and anti-self righteousness day. @SHAHID SATTAR What’s being “imposed” is not Valentines Day but the narrow, hateful and unlettered views of a few backed by threats of violence. What your ilk really wishes to control is thought itself. And look where that approach has gotten us. @Fawad ur Rahman Sure. That is your right. Best way to say NO, don’t show up. We have ruined the basant festival because of our own wrong doings and habits beyond control resulting total ban now it’s valentines turn , why not celebrate it in a moderate manner without creating the mess again . 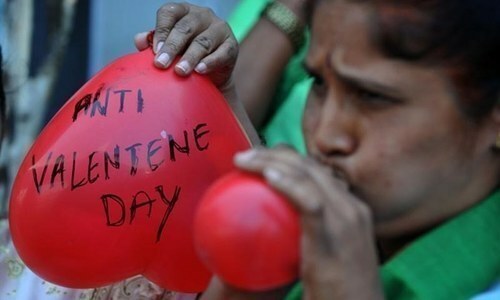 We should oppose if Valentine’s Day is imposed on us. We should oppose if moral policing is imposed on us. If we don’t stand up to our right of choice now then we will slide deep into extremism. Act now or regret forever. 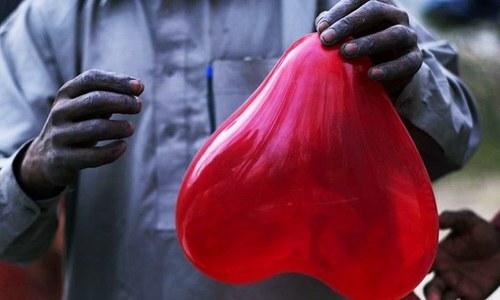 Is Valentine a big issue in Pakistan, there are more important things to worry about. Nothing should be imposed, even faith. That is what our religion teaches us in whose name we impose things. Appreciate Dawn for the much needed voice it raised for the occasion. Flip side is others have right of expression too. And what about what valentine is? @SHAHID SATTAR , Can everything in this world be divided into two categories Muslim and non Muslim ? @Azad khial , Our religion has decided about what codes to follow in all aspects of life. That is what primarily matters to most of us. Copying other societies' and religious festivals is not for us. They have the right to practice the same in their own societies and countries. Yes somehow right to chose is seen as a threat by many who believe their narrow minded approach to what should be way of life for others is under threat..It is unfortunate that the very essence of democracy is unacceptable to so many in pakistan..
there is no Valentine day in Islam and Pakistan is an Islamic republic.you accepted the faith so you must follow it. Love is in the air. Happy Valentines day (in advance). @Question., Not everything but some things can be and must be divided so as to follow the norms, specially in a country which was established in the name of religion. @Akil Akhtar, when was the last time someone even suggested penalizing you for not adopting or participating in any 'western rubbish'? Another suppression of human affection. Now I understand why the 18 year old ran away from the suppressive regime of Saudi Arabia. @Dsingh, There is also no hypocrisy in religion, yet we see nothing but hypocrisy, some manifest in these very comments. @Akil Akhtar, -Please update yourself all the science or commerce and arts knowledge extracted ,developed and obtained by the west .Go and leave in stone edge . @Uzair , "when was the last time someone even suggested penalizing you for not adopting or participating in any 'western rubbish'?" There are many who are penalized for not adopting or participating in any 'western rubbish', in the west. Girls were thrown out of schools for not "uncovering their heads as per western standards" in many most liberal European countries. Freedom is a prisoner of patriarchy and condescension. This attitude isn't a part of our Indus Valley civilisation and culture. Tolerance and acceptance of differences is. The editorial supports this view. Who gave powers to the religious leaders to run the religion in the country. Those deeming it western culture should not celebrate it and let the others express and destribute the message of love and peace. @Akil Akhtar, don't follow it but don't tell what they should or should'nt do. Those who are criticizing valentine’s day are the ones who wander for celebrations on that very day. @Akil Akhtar, Who is imposing anything on you? Are you forced to buy V day flowers gifts etc.? I don't understand how celebrating Valentine's day is forbidden in the religion. One can share love with his/her husband on this day, even with a wife or husband to be or someone they want to marry with. Mullah is against love, technology, happiness, progress and success. What is wrong is simply wrong and opposition to rubbish and immoral culture of west is also our rights. Anything brings the society to its shame must be stopped. People need to be educated right way. Media or businesses should not advertise this occasion at all. At the same time no one has a right to be a moral policeman or judge. And at the end what this generation decides whether wrong or right next generation will be effected. Beautiful and a bold article, very well written. I must appreciate the Dawn to have courage to speak against a few who want to impose what they think is right.While ignoring the aspirations of many who think otherwise. Very well done The Dawn, you have the courage to speak for those who are unheard, but are there.